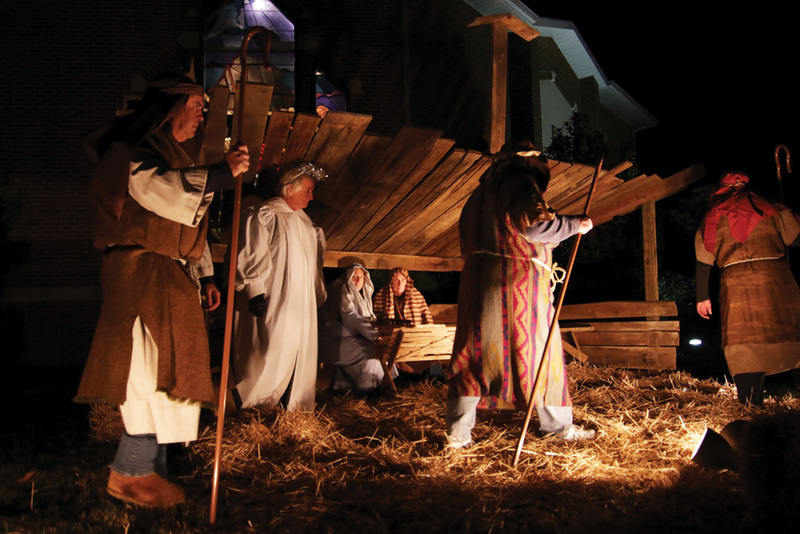 Mariner’s United Methodist Church hosts a Live Nativity scene each year. This year’s Nativity will be held on Friday, Dec. 14, outside of the church starting at 6 p.m.
As night falls on Friday, Dec. 14, a stable outside Mariners’ Bethel Unity Methodist Church in Ocean View will come to life. About 40 to 50 actors will gather at the church to participate in the church’s annual Live Nativity program, according to coordinator Jim Klinedinst. The program, in which church members silently act out the story of Jesus’ birth, includes narration by church pastors, who read passages from the Bible that tell the story, Klinedinst said. The stable itself was built for the first live Nativity at Mariner’s Bethel, by church member Duncan Cornell, and has been used outside the church every year, except last year, when the Nativity was held inside the church due to extremely cold temperatures and wind. For the first time, the Nativity was held in the church social hall, which Klinedinst said “worked out pretty well,” adding that he was pleased with the “intimacy” of the social-hall setting. This year, the church is hoping to again hold the program outside, per tradition, but Klinedinst said they are keeping an eye on the weather forecast, which at press time showed a decent possibility of rain Friday evening. He said he wanted to “get the word out” that if the rain is too heavy on Friday, the church will again hold the event inside. The Nativity story will be told four times, starting at 6 p.m., and again each half hour through 7:30 p.m. Klinedinst said that, that way, folks can pick whichever time suits their schedule. He said that, although the church has held the live Nativity on a Wednesday night in the past, the decision was made to try a Friday night this year, to see if it allows more people to attend. Each telling of the story on Friday will have different actors portraying the main characters in Jesus’ birth — from Mary and Joseph to the shepherds and the angel — giving more people the opportunity to participate, and giving the actors a break from the cold, Klinedinst said. The actors are told ahead of time that the program is a “no-experience-required” endeavor, he said. “They just have to show up dressed in character.” As for preparation, he chuckled and pointed out that “the story never changes — it’s been told for 2,000 years,” so there’s never a worry about new material. Although the Nativity did include live animals for a few years, it was eventually determined that the animals didn’t take stage direction very well and often upstaged the actors, Klinedinst said. His wife, Michelle’s horse Pokey was included in past Nativities, he said, “but he was more interested in socializing” with the audience and the cast. The Mariners’ Bethel Praise Band leads musical interludes during each program, with the audience encouraged to sing along with the traditional Christmas carols. Hay bales are set up in front of the stable for audience seating. Between each telling of the Christmas story, everyone is invited to share in hot chocolate and cookies. The church’s youth group will have a particularly busy night on Friday, as they help quite a bit with the Nativity program, and they will also be wrapping gifts to be distributed to area families, Klinedinst said. The Nativity program has always been viewed as a chance for the community to come together and take a break from the hustle and bustle of the season.